All parents want the best for their children, to give them the perfect start in life, and that includes the food they eat. However, choosing the freshest foods and preparing them in the most beneficial and appealing ways is not always an easy task. In SuperFoods, bestselling author Annabel Karmel shows you how to combine creativity with delicious ingredients in order to provide your child with a healthy foundation. You'll find recipes that not only taste great but also maximize the nutritional power of certain foods to boost your child's health and well-being. And Annabel, a mother of three who has written fourteen bestselling books on healthy food for children, knows better than anyone not only what children should eat but what children will eat. From advice on steaming carrots to detailed weekly menus for every stage of development, Annabel's unwavering expertise will teach parents how to provide the nutrition their children need. SuperFoods is both a cookbook and a reference manual, helping parents recognize the varied nutritional value in even the simplest foods. Eating by color -- Annabel's advice for choosing produce -- encourages parents to use foods in tempting combinations. With a focus on the basic components of your child's diet -- carbohydrates, proteins, and fats -- Annabel provides easy instructions for crafting balanced meals. SuperFoods will guide you through your child's first five years -- from first foods for your baby to tasty meals for fussy toddlers, from scrumptious lunch-box ideas for school-children to irresistible family suppers. Food is both nourishment and nutrition, and Annabel Karmel's SuperFoods puts fun back in the equation. In addition to a variety of delicious recipes and invaluable advice, SuperFoods also includes: More than 130 recipes suitable for children of all ages -- from the best first foods to tasty family meals. Menu charts to help you plan ahead -- most recipes are suitable for freezing. Information on how to avoid food allergies and common childhood complaints such as colic, constipation, and eczema. Suggestions for healthy convenience foods to keep in the pantry. Tasty recipes that harness the power of SuperFoods to promote growth and energy and boost immunity and brain power. 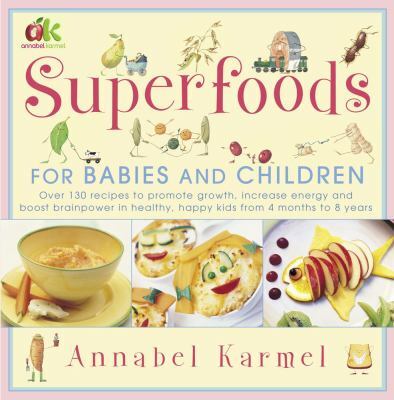 And much, much more!Karmel, Annabel is the author of 'Superfoods For Babies And Children' with ISBN 9780743275224 and ISBN 0743275225. Loading marketplace prices 25 copies from $0.02 How does the rental process work?